Welcome to another week of The Wire Troll. As we approach the second half of the season, our goal is to recommend players that can assist you in capturing a Fantasy basketball championship. Whether you participate in a shallow or deep league, we have it covered. This week, you will notice several players on our list who have taken advantage of promotions to their respective team’s starting lineup. 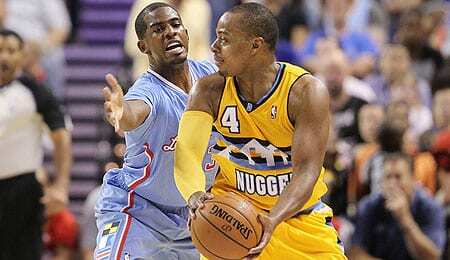 Randy Foye, SG, Denver Nuggets: A few weeks back, Coach Brian Shaw demoted Foye from the starting lineup in favour of Jordan Hamilton. When Hamilton failed to seize the job, Foye was given another opportunity and this second chance has been just what the doctor ordered. Foye has averaged 15 points, 3.5 assists and made 17 treys over his last five games (take a look at the video below to get a sense of his outside shooting touch). With Denver in dire need of scoring, Foye has terrific upside moving forward. Marco Belinelli, SG, San Antonio Spurs: Similar to the Denver situation, Belinelli has been promoted to the Spurs starting unit in place of the struggling Danny Green. Now seeing 30-plus minutes per game, Belinelli has registered 18 points, four assists and just under three treys per game during his last four outings. Courtney Lee, SG, Memphis Grizzlies: Lee was acquired by the Grizzlies in a three-team trade this week that also saw Jerryd Bayless go to Boston. Lee is going to get additional offensive opportunities and playing time in Memphis and can help you in several categories. Evan Fournier, SG, Denver Nuggets: Fournier, a former first round pick that was a highly regarded offensive player in Europe, has begun to see additional playing time with Denver firming up its player rotation. He has responded well including 19 points, four rebounds and a steal in just 18 minutes Thursday. If Fournier starts regularly seeing 20 to 25 MPG, he could be a nice pickup in 14-team leagues, but for now, he’s definitely worth a look in leagues of 16 teams or more. Kentavious Caldwell-Pope, SG, Detroit Pistons: The Pistons’ first round pick last year is beginning to show his true talent. Over his last five games, Caldwell-Pope has averaged 12 points with just under two steals and two treys per outing. Coach Maurice Cheeks is struggling to find the proper chemistry on this underachieving team, so keep an eye on this youngster, as the PT has definitely been there for him (over 30 MPG in the last five). Kris Humphries, PF, Boston Celtics: With Jared Sullinger struggling lately, coach Brad Stevens opted to elevate Humphries to the starting power forward spot. Humphries is yet another player that has taken advantage of the situation including a monster game on Friday (16 points, 14 boards, two steals and three blocks). Mike Dunleavy Jr., SF/SG, Chicago Bulls: With Luol Deng getting dealt to Cleveland, Dunleavy takes over as the starting small forward in the Windy City. Dunleavy can help you in scoring and threes, with some assists, rebounds and steals sprinkled in. C.J. Miles, SF/SG, Cleveland Cavaliers: Miles is proving to be an offensive force recently, and he should fit nicely with the newly acquired Deng. Offensively, Miles is a streaky player that is capable of lighting up the scoreboard. He displayed that ability Tuesday, scoring 34 points with a Cavalier record 10 three-pointers against Philadelphia. Patrick Patterson, PF/C, Toronto Raptors: Patterson has become a key player off the bench as the Raptors have experienced a recent resurgence. Acquired from Sacramento as part of the Rudy Gay trade, Patterson can be a valuable Fantasy player as he contributes scoring, threes, rebounding and blocks from the forward position (he’s also centre eligible in some leagues). The former Kentucky standout is still young and improving, so watch him closely. Enes Kanter, Utah Jazz: We recommend Kanter because his ownership rate has sunk below 50 per cent (ESPN leagues) courtesy of a recent slump and demotion from the starting unit. However, he’s shown signs of life recently with 13 points, 7.5 boards and one block per game over his last four outings. Kanter certainly has the ability and talent to continue being productive, so he makes for a very nice speculative pick. Robert Sacre, Los Angeles Lakers: Sacre is yet another player taking advantage of more playing time as a member of the first unit. With all of the Lakers injury problems and Shawne Williams being waived this week, Sacre can help your Fantasy squad with moderate scoring, rebounding and blocks. Pero Antic, C/PF, Atlanta Hawks: With the devastating shoulder injury suffered by centre Al Horford, the Hawks have been scrambling to fill the huge void. Antic has been the starting centre recently and has experienced some Fantasy worthy moments. He’s unique in that he can shoot and make treys from the centre position. Now it’s your turn, tell us below in the comments section how you feel about these players or let us know about any recommendations of your own. For Fantasy hoops player alerts during the week, follow Bob on Twitter @hoopsbobray.